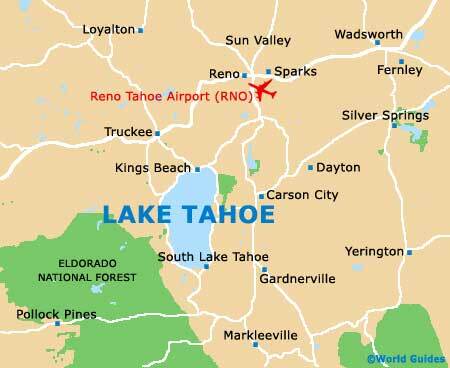 There are many spreading expanses of wilderness and parkland surrounding shoreline areas of Lake Tahoe. 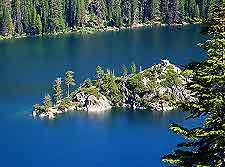 The DL Bliss State Park encompasses the Emerald Bay and the Sierra Nevada mountains, covering more than 1,800 acres / 728 hectares in total. On the northwesterly side of Lake Tahoe, the Donner Memorial State Park is close to the town of Truckee, while to the south, the Glen Alpine Springs makes for a very appealing day out. Located on the westerly coastline of Lake Tahoe and some 10 miles / 16 km to the south of Tahoe City, the Sugar Pine Point State Park is easy to reach along the Highway US-89, being home to a popular nature center. 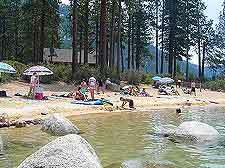 Many tourists from all around Lake Tahoe come here on sunny summer days, to sunbathe of the various beaches, which stretch for some 6 miles / 10 km and are both sandy and pebbly. Other highlights around the vast Emerald Bay include nature trails, camping grounds, picnicking facilities, mature Ponderosa trees and naturally dwarfed, weather-beaten sugar pines. Quite unmissable is the Balancing Rock nature trail, where you will find a rock weighing more than 100 tons, which is balanced somewhat precariously on a narrowing base. You could easily spend several days exploring the DL Bliss State Park and still leave plenty left unseen. The Donner Memorial State Park lies on the very outskirts of Truckee and is of great historical significance, since it was here that the ill-fated and rather well-known Donner party was stranded by heavy snowfall, during the winter of 1846, with some of these notorious emigrants resorting to cannibalism to simply survive. Located at the Alder Creek, the site of the Donner Camp is now listed as a National Historic Landmark and offers visitors around 2.5 miles / 4 km of hiking trails, along with scenic lake shores and some interesting Native American artifacts, which are housed within the Emigrant Trail Museum. Also worth looking out for its the Pioneer Monument, which is close to the museum itself. Literally miles upon miles of hiking trail await within the vast Sugar Pine Point State Park, together with a swimming beach and an array of recreational activities, which in the summer months include fishing, while in the winter months, cross-country skiing becomes the order of the day. 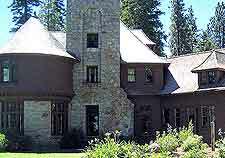 The Sugar Pine Nature Center, in the day-use area and near to the Hellman Ehrman Mansion, is always very popular and regularly screens a movie explaining the story of the lake's evolution. Sited on the south shore of Lake Tahoe and in relative proximity to Camp Richardson, the Glen Alpine Springs offers a leisurely 2-mile / 3-km round hiking trail, which takes in sights such as the notable Soda Water Spring and the Desolation Valley Wilderness. Take you time to properly enjoy the views and scenery, which includes dramatic waterfalls, meandering creeks, endless native flora and fauna, and the magnificent Glen Alpine Canyon. Be sure to bring your camera - and a picnic. 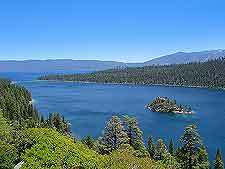 Sited on the northeasterly shore of the lake and close to Incline Village and Carson City, the Lake Tahoe Nevada State Park is to be found in western Nevada. The park encompasses many leading attractions, such as the beaches of Sand Harbor, the Hidden Beach, the Memorial Point and also Spooner Lake.